Emerson and Thoreau both know, of course, that what the majority wants you to do often sounds noble — working for abolition, contributing to your local church or school, fighting for your country. They know, too, that maybe such things are noble. But they want to figure the matter out for themselves; they want to read, to think, to write, to determine who they are — from scratch and with no presuppositions, presuppositions about the value of good works and causes included. So by and large doing politics becomes for them a temptation to be resisted, because in politics they see the abolition of the individual, and the cultivation of the individual is what chiefly matters. Emerson does frighteningly well at abstaining from politics; he keeps political concerns from bothering him by not bothering about them. He doesn’t go to Brook Farm, and refuses to speak out on slavery: “I have quite other slaves to free than those negroes, to wit, imprisoned spirits, imprisoned thoughts, far back in the brain of man.” (He is induced when young to write to President Van Buren in protest of the forced migration of the Cherokees, but soon repents having done so.) Thoreau, however, gets involved earlier, because he sees what Emerson doesn’t see until later — until the passage of the Fugitive Slave Law, which obliges citizens of free states either to aid slaveholders or to break the law — namely, that in certain situations you cannot keep out of politics. Thoreau doesn’t see, or doesn’t believe, that generally you’re part of the problem unless you’re part of the solution, or that to avoid doing politics is in general to leave the status quo in place; rather he notices specifically, with a kind of microscopic genius, that in paying taxes abstinence just isn’t a choice, because you either pay them and collaborate with the state or refuse to pay them and defy the state, but in any case you do politics. Between collaboration and defiance he has to choose defiance, has to defy the state and refuse taxes, because he judges that the state in tolerating slavery is violating his moral code, and he therefore cannot collaborate with it. So he refuses the taxes, gets put in jail, and writes the essay that eventually exercises so much influence on modern political life. That influence is the result of his actions. But again, it is not what he was aiming at; when he himself talks about his actions, his focus is on the evil avoided rather than the good accomplished. The point of his refusing his taxes is to avoid collaborating with slavery and imperialism, and to return as soon as possible to his real work — not politics but “huckleberrying”, or getting his shoes mended, or writing. Politics isn’t what he wants to do, it’s what he can’t avoid doing, and it results not from volition but from necessity. Too many exhortations to political action give only a scanty account of just who it is that’s doing the exhorting. So I want to speak concretely about my own situation, and about the relation between that situation and the political action I’ve been able to take. As I said, I find Thoreau’s stance attractive, and in some ways my temperament is like his; politics isn’t what I like doing, not at any rate as much as I like doing music, or translating, or teaching, or being with friends. But no one living in the United States now can be placed as Thoreau was placed, or think as he thought; the state is stronger, the individual is weaker, and the relation between the state and the individual resister is murkier and trickier. 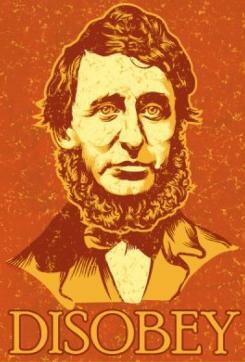 To begin with, Thoreau had a choice about paying taxes. To him and to every other Concord taxpayer came the tax collector, who did not yet have the money and had to ask for it, and who therefore could be obeyed or disobeyed. Many of us don’t have that choice; the government collects the taxes before we ever see the money the taxes have been collected from. I wonder sometimes how we let ourselves be deprived of so important a choice, and wonder also how we would choose if we could. So the first thing for me to explain is the unusual circumstance of having tax payments to refuse in the first place. My wife, the pianist Cynthia Schwan, resumed teaching piano in 1985, the year our twin daughters started kindergarten and also the year that she and I began to consider doing tax resistance. (1) Not having tax withheld from her income left us owing taxes and thus able to refuse paying them — ninety dollars at first, then gradually up to about two thousand dollars as Cynthia attracted more students. Each year we would prepare our returns, or have them prepared for us by the accounting firm of H.R. Block; then, taking from the War Resisters League an assessment of what percent of the federal budget went to the military, we would subtract that percent of what we owed from the total, send the remainder to the IRS with a note explaining our action, and deposit the refused taxes in an alternative fund, where the interest would be used for good causes and the principal would remain available to us should the IRS put a lien on our property. It’s an equally unusual circumstance that I can refuse taxes publicly without jeopardizing my job. Thoreau’s security in his community was partly the security of the spirit, partly that of the familiar eccentric whom his neighbors would not turn away; mine is at least partly the security of academic tenure. We refused our first ninety dollars in April of 1986; by the end of that year I had been granted tenure in the English Department at Wellesley College, and most of my public activity as a tax resister (presenting talks, writing essays, giving interviews) came after that — deliberately after that, since I was afraid to do public tax resistance while untenured. Probably I wouldn’t have incurred much of a risk; the College administration has since said that it considers my tax resistance a legitimate form of political expression — though not so legitimate that it refrained from executing a federal levy on my salary. An executive, a letter carrier, an aspiring lawyer, indeed anyone who works for the government or has a job requiring the persona of a law-abiding or patriotic citizen: all these people would run greater risks than I have run, and probably greater risks than I would have felt able to run. So someone might ask here, “isn’t tax resistance as you describe it, then, something that most people aren’t in a position to do without running much more risk than you have?” There are two ways of answering that question. One is to say, yes, that’s the truth, but not the whole truth. There are other ways of refusing taxes. Some resisters choose to keep their income below the taxable level. Some choose to alter their W-4, withholding tax form so as to have less tax withheld by their employer, though the stated financial penalties for resisting taxes in this way are severe, and I don’t know that I would have had the courage to risk them. Many resisters, myself included, begin trying out tax resistance by refusing to pay the federal phone tax (a tax instituted for the benefit of the military), and incur little danger except that of the phone company’s mistakenly counting the refused tax as unpaid phone service. And by ingenuity and persistence, tax resisters have found a good many employers at least as sympathetic as the academy. The other answer, however, goes like this. Suppose that none of what I have just described is the case; suppose that every employer is hostile, suppose that everyone prudently declines to commit W-4 fraud, suppose that no one wants to go through the rigmarole of refusing the monthly phone tax of thirty-nine or seventy-one cents. Still there are many situated as I am, who are deeply opposed to the policies of the federal government, who have taxes to pay, and who would not jeopardize their jobs by refusing to pay them; and though I hope not to speak only to such people, I would gladly accept that limitation if by doing so I could better understand how they, who do not have to, work for peace and pay for war. Like Thoreau, I judge the state to be no just receiver of my taxes on the basis both of general beliefs and specific assessments: an absolute belief in the sanctity of human life and a general hatred of weapons of mass destruction, plus a lot of sharp, specific, horrified disagreements with United States action in, say, Nicaragua, Grenada, Panama, and Iraq. As a Jew, I have a deep fear of being a docile citizen, meekly acquiescent in state violence, and think often of the Nuremberg principles as warrant for my civil disobedience; (2) as a timid pacifist during the war in Vietnam, having watched friends act more bravely than I did in resisting the war I joined with them in opposing, I feel I owe them (and myself) a debt of honor. But as Thoreau in his essay doesn’t argue for his condemnation of slavery and of the state’s acquiescence in it, probably because he thinks most of his readers share in that condemnation, so I consider these beliefs and assessments of mine unremarkable. There’s little that’s uncommon in them, and much that’s shared by many of my friends and colleagues; so for me to name them is only to wonder again how my friends and colleagues and I proceed from common belief to differing conduct. Thoreau resisted once, was put in prison, and then wrote his essay, which reflects his righteous satisfaction with that single triumphant encounter. An earlier version of my own essay, published in November 1989, had something of Thoreau’s tone; the IRS had not then collected on us, only sent numerous threatening letters, and I was cheerfully feeling that the IRS was, as tax resisters like to say, ninety per cent bluff. Since then the IRS has instituted an Automatic Collection Service, and we have been collected on three times, once by a levy on my salary and twice by levies on our bank accounts; each time the levy took not only the original refused tax but also penalties and interest. Even now the IRS occasionally fumbles; before levying my salary it attempted to levy a bank account I had closed out fifteen years previously, and between the first bank levy and the second it refunded the levied money with interest. But this clumsy, capricious power frets me more than a more efficient and so more predictable bureaucracy might have done; I have felt dully, heavily oppressed by it. I have not experienced great suffering, any more than I have run great risks; but anyone contemplating doing tax resistance ought to know what it feels like to have tax resistance punished. This hurt, however much I found it mistaken. But for the most part no one denounced us for what we were doing, and lots of people surprised us with their support. So the levies did only small harm to our finances and to our public social lives. But they felt oppressive nonetheless, for several reasons. My own temperament was among them: an odd mixture of outlaw and good citizen. The outlaw refuses the taxes; the good citizen calculates the refused taxes honestly, proclaims to the IRS that the refusal has been made, and then, irrationally enough, feels humiliated by the consequences of the outlaw’s behavior. (Many tax resisters, I should say, are less split in this regard than I am, resist authority more boldly and systematically than I do, and also do better than I do at keeping their money from the IRS — not filing returns, tailoring their W-4 withholding tax forms to their tax resistance, moving their money from bank to bank or out of banks altogether, choosing employers sympathetic to their politics. “Wait for my brother,” said the littlest billy goat Gruff. “He’s far bigger and stronger than I am.”) I like obeying authority, and fear punishment; and here was disobeyed authority executing punishment, and punishment being carried out by acquaintances and neighbors, who politely took the money away and sent it to the IRS. Also, I had looked forward to some encounter, some Hollywood confrontation — forthright James Stewart standing up to corrupt Claude Rains in Mr. Smith Goes To Washington. But the dull pressure of the levies only blurred the moral passion. No IRS agent called, or wrote, or came to my door; there was no sneering Controller at Wellesley College, no smug and vindictive banker — no enemy, no villain, no interruption in my amiable relations with the College staff or the bank treasurer, only the bland, awkward, numbing workings of the system as a whole. Thoreau writes, “I meet this American government… directly, and face to face, once a year, nor more, in the person of its tax-gatherer; this is the only mode in which a man situated as I am necessarily meets it.” Usually when I read that sentence I think, “today we meet the government everywhere”; in another sense, though, today we meet it nowhere. I have, then, felt the great power of government exercised effectively against me. That power blurred my certainty; also, obviously, it took away the refused taxes, and in fact the IRS has through interest and penalties collected more from us than we refused in the first place. So I have had to wonder, as Thoreau did not, what happens when tax resistance fails? What happens when it becomes routine? Because it is simply not true now, if it ever was, that “if one honest man… ceasing to hold slaves [or to pay taxes], were actually to withdraw from this co-partnership, and be locked up in the county jail therefore, it would be the abolition of slavery [or state violence] in America.” Against Thoreau’s serene evening in the Concord jail, and his certainty that his truth would prevail, I have had to set the fretting, unsettling experience of resisting repeatedly, being levied repeatedly, and not bringing about the millennium. I have had to ask, in the Quaker phrase, how to keep on keeping on. But though comforting, this shift in perspective is not enough, not enough of a response to doubt and the experience of futility; in fact I have kept equilibrium, and hope to keep it still, not through any mental exercise but through tasks of political activity. I should say that this is precisely the opposite of what I expected. To begin with, I had when starting to do tax resistance shunned political activity, and in a sense hoped through resisting taxes to avoid it. Thoreau’s words, again: “I meet this American government… once a year, no more, in the person of its tax-gatherer; this is the only mode in which a man situated as I am necessarily meets it.” As I had to learn, however, no one can say that now; we meet the government far more often than Thoreau did, and I found that by starting with tax resistance I had unknowingly committed myself to a fair amount of doing politics. (Maybe, in fact, tax resistance is unpopular in part precisely because people contemplating it rightly calculate that its consequences are likely to occupy a good part of their lives.) So I was wrong in thinking that doing tax resistance could meet all my political obligations. But I was also wrong in my understanding of how political obligations functioned. I had shunned doing politics because I thought it would disorient and de-center me. In fact, however, I have in accepting the consequences of tax resistance found them not a threat to equilibrium but a source of it, have found that what makes it possible for me to continue doing tax resistance is precisely the tasks that doing tax resistance lays upon me. All this has of course taken up a lot of time; tax resistance for me has not turned out to be a way to get back with a clear conscience to “huckleberrying.” It has meant meetings and actions, conversations and letters and essays, talks and interviews. But in fact these activities have not encumbered my life but ordered and simplified it. For one thing, they have seemed necessary, arising like the original act of tax resistance from the narrowing of choice to a single action;and to find necessary work is a great blessing. They have provided a standpoint from which to speak about politics from the authority of experience rather than on the basis of opinion. Most importantly: though doing tax resistance revealed my anonymous relation to my unhearing government, my merely polite relation to some of my institutions, it also helped me find a previously hidden part of my real community. Emerson after dismissing the philanthropist admits, “there is a class of persons to whom by all spiritual affinity I am bought and sold”; doing tax resistance has helped me in the difficult task of finding out who some of these persons are. To sit on the Grants and Loans Committee of New England War Tax Resistance, and to dispense the interest on refused taxes to a youth group in Chelsea, a video for cable television on United States involvement in Central America, and a people’s garden in Roxbury is to be reminded of the ideal community, however blurred and fragmented, that war tax resistance is done on behalf of, in the hope of helping to make it clear and whole. Thoreau concludes, “I please myself with imagining a State at last which can afford to be just to all men.” I prefer to conclude not in the utopian end but in the difficult beginning, here and now, by saying simply that tax resistance seems to me a good start. It has been a good start for me; but I believe it would also be a good start generally, a way for those opposed to American weapons and American policies to begin saying no, and then to see what happens later. (1) My wife and I both believe in doing tax resistance, but not on the same grounds. I have framed this essay from my own viewpoint, and am not claiming to speak for her. (2) For Nuremberg principles as a warrant for civil disobedience see, Francis Anthony Boyle, Defending Civil Disobedience Under International Law, Salem, OR: Center for Energy Research, 1988. (3) The United States has signed various treaties and charters incorporating the Nuremberg principles, and thus made them part of “the supreme law of the land.” Principle VI.a (i) states that “the planning, preparation, or waging of a war of aggression or a war in violation of international treaties” is a crime against peace. The military build-up during the Cold War, especially the stockpiling of nuclear weapons, constitutes just such “planning and preparation.” Principle VII states that “complicity in the commission of a crime against peace… is a crime under international law.” I believe that for me to pay taxes freely to the United States military budget is such a crime. EDITOR’S NOTE: Lawrence A. Rosenwald is Anne Pierce Rogers Professor of American Literature, and Professor of English at Wellesley College. He has also taught in the Wellesley Peace and Justice Studies Program since 2000, and has co-directed that program since 2001. Among his published works are his edited editions of the journals of Ralph Waldo Emerson for Library of America, who recently commissioned him to edit an anthology of writings of peace and pacifism. As he states, “I’ve been a pacifist and war tax resister since 1987, that being the occasion for the writing I’ve done on nonviolence.” Please note his article, “On Nonviolence and Literature”, which we previously posted here.